Why is the size of the organisms characteristic of species? Why is there proportionality between the organs of an organism, such as the length of the extremities in humans? Why, even in the organisms that grow constantly, there are organs that have some dimensions established, such as leaves or tree fruits? Ultimately, these characteristics will depend on the number and size of the cells that compose each organ of each organism. However, already the first microscopists observed that the largest animals were because they had more cells, not because they had larger cells. Then, why have the cells the size they have? This is an unresolved question and, although an accepted theory explaining the size of cells has not been achieved, several hypothesis have been proposed. 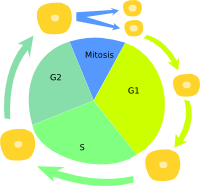 The cell grows in size and when it reaches an appropriate one, it goes from phase G1 to S. It is the size what determines that this checkpoint is crossed and, once crossed, the cell will be divided. Balance between division and growth. In a culture of cells of a metazoan or in unicellular organisms the size of the cells is conserved from generation to generation. In each division cycle, the cells go through different phases☆. The G1 phase☆ is the growth phase. In general, cells have to grow twice their size to divide and, once achieved it, the S phase begins (DNA synthesis), and they can no longer stop until they divide and reduce their size by half. It is proposed that the balance between growth and division is what determines the size of the cell. Long-cycle cells could grow more, while cells that divide quickly do not have enough time to grow beyond a certain size. Each cell type, in some way, knows that it has to divide when it has reached a certain size. Therefore, there is a sensor that detects a cell size threshold from which the cell irretrievably enters into division, and that sensor is activated at a determined cell size in each cell type. The G1 phase exit to S when the cells have reached a certain cell size has been experimentally demonstrated. The threshold of the signal that determines the size must be a molecular mechanism that can vary depending on the cell type. Thus, this measure is absolute for the cell, that is, it is a matter that each cell resolves independently. What are the cell size sensors? It has been proposed that the amount of ribosomes is a cell size sensor. The majority of the energy of the cell is used to produce ribosomes. In yeasts, it has been found that the amount of ribosomes depends on the amount of nutrients, which adapts the capacity of translation (production of proteins), to the existent resources in the environment. Interestingly, the transcription of other proteins is not affected. In metazoans it seems that the amount of ribosomes is also an indicator of cell size, but the molecular pathways that affect its synthesis are multifactorial and difficult to unravel. There are other proteins, such as cyclin E, that could act as sensors taking into account not their concentration but rather their rate of synthesis. Nevertheless, the size also depends on external conditions, such as the availability of food, temperature or the presence of growth factors. Yeasts subjected to nutrient enriched environments increase the cell size while in poor environments they decrease it. In flies under diverse experimental conditions, it has been found that the cell size and the number of cells contribute to the increase of the size of the organism, without knowing exactly why. Thus, flies raised in cold environments are larger because they have larger cells, while those grown with more food are larger because they have more cells but with normal sizes. Therefore, the experimental results suggest that the cell size depends on the cell type that we are considering and the conditions in which they are found. Even so, there is a functional variation on the size of some organs due to an increase in cell size. Perhaps the clearest example is what happens in muscle tissue, but also in adipocytes when having access to abundant food, or the liver during pregnancy by hypertrophy of hepatocytes. Interestingly, the regeneration of the liver after an injury is by proliferation of hepatocytes. There are other external factors that can control the relationship between division and growth such as those that favor division or mitogens and growth factors. For example, the insulin-like growth factor (IGF) seems to control cell size. When it is mutated in mice, the cell size decreases but also the number of cells. Thus, there are individuals that can be 50% smaller than their controls. On the other hand the epidermal growth factor (EGF) can promote the cells to divide without the need for growth. An additional issue is how to maintain the appropriate volume altered by swelling or shrinkage due to osmotic pressures. The cell knows which size it should reach and how to maintain it. In response to osmotic pressures with water entering or leaving the cell and modifying its volume, several sensors have been proposed. These sensors trigger cellular responses to restore cell size: density of molecules and ions that affect the metabolism and trigger osmotic processes or mechanical changes that affect channels and transporters of the plasma membrane, which cause osmotic changes in the direction to restore the original volume. The number of copies of a genome is another factor that affects cell size. The more ploidy (greater number of copies of the genome) a cell has, the greater it is. In salamanders, pentaploid individuals can be obtained. These animals are as large as the diploid, but their cells are bigger; then, the body has fewer cells. Interestingly, there is proportionality. For example, a tetraploid has half as many cells as a diploid and therefore twice as large. We could think that it is the amount of DNA what determines the cell size. In plants, it has been shown that polyploidies produce larger cells, without affecting the final size of the structure; simply the mitosis rate is decreased. When increasing the ratio of cytoplasm to that of the nucleus, the amount of certain molecules in the nucleus increases. It is related to ploidy. The nucleus is not larger in biger cells so it can detect more of a given molecule in the cytoplasm, although in the cytoplasm the molecule is always at the same concentration. In fact, the polyploid cells have larger nuclei, so it could be that it was not the amount of DNA but the nuclear volume what determined a larger cell size in polyploid organisms. Again, this cannot be the only cause since in an organism there are different cell types with different sizes and have the same genetic endowment. Which are the organ size sensors? One consequence of these observations is that it would seem that organisms were able to measure the dimensions of their bodies and the size of their organs to keep them within the characteristic proportions of their species. It is curious that when the cells are manipulated to produce smaller cells in an organ, for example by accelerating the division rate, the size of the organ will remain the same. The same happens on the contrary, when the cell size increases, the organ will be equally large but with fewer cells. Probably due to a competition for growth and survival factors, whose concentration determines a threshold detected by a molecular way called hippo. This way prevents the oversizing of an organ, and seems to act in both flies and mammals. There are species that always grow, such as some fish and plants. However, in plants there are parts that do have limited growth such as leaves. In fish with indeterminate growth, it has been found that from one size the increase in the number of cells is changed by the increase in the size of the cells, as the main growth factor. In summary, there seems to be an appropriate size for the cells, which can vary depending on the cell type. This could indicate that each cell needs an optimal size to perform its function. This size does not seem to be due to physical conditions, but rather due of adaptive issues, since there are cell lines that can change their size in response to stimuli. Another idea that arises from the observation that in a tissue there are cell types with different sizes is that the control of cell size could be a property acquired autonomously by the cell. Numerous molecules seem to affect cell size, complicating the interpretation of the cellular response to experimental conditions. A single gene controlling by himself only the size has not been found, even in organisms as well known as bacteria. The conclusion is that cell size may be conditioned by numerous genes and signaling cascades with confluent actions. Despite this, there must be sensor systems that have been maintained during evolution and that keep most cells within characteristic size parameters. Arendt, J . 2007. Ecological correlates of body size in relation to cell size and cell number: patterns in flies, fish, fruits and foliage. Biological reviews. 82:241-256. Baserga R . 2007. Is cell size important? Cell cycle. 7:814-816. Cook M, Tyers M . 2007. Size control goes global. Current opinion in biotechnology. 18:341-350.
Cooper S . 2004. Control and maintenance of mammalian cell size. BMC cell biology. 5:35. Day SJ, Lawrence PA . 2000. Measuring dimensions: the regulation of size and shape. Development. 127: 2977-2987. Ginzberg M, Kafri R, Kirschner M. 2015. On being the right (cell) size. Science. 348(6236):1245075. doi: 10.1126/science.1245075. Hoffmann EF, Lambert IH, Pedersen SF . 2009. Physiology of Cell Volume Regulation in Vertebrates. Physiological reviews. 89:193-277. Leevers SJ, McNeill H . 2005. Controlling the size of organs and organisms. Current opinion in cell biology. 17:604-609. Rupes I . 2002. Checking cell size in yeast. Trends in genetics. 9:479-485.